Lessons From Chile: Better Building Codes Work, so Why Don’t We Have Them? Chile’s seismic construction codes saved lives in the latest quake, but what if the next Big One happens here? The earthquake in Haiti prompted a lot of architectural analysis of buildings there, and in megacities around the world. Without proper planning–and stricter building codes–most of the biggest cities on earth are “rubble in waiting.” (See a round-up of the current discussions about Haiti here.) If Haiti showed architecture’s failure, Chile might show its success. The quake there–at 8.8 on the Richter scale, 500 times as strong as the one in Haiti–was devastating, but not nearly as cataclysmic as it could have been had the country not been expecting it for half a century. After the strongest earthquake ever recorded (9.5) hit Chile in 1960, and another major quake struck in 1985, the country adopted a seismic design code for new buildings. Other factors are at play here, of course–strong codes mean nothing if your government isn’t capable of enforcing them–but architecture’s successes and failures in Chile, as in Haiti, are worth examining. On All Things Considered, MIT engineering professor Eduardo Kausel explained that Chile’s codes were set up to save lives, but also to keep buildings and urban infrastructure in one piece. The BBC outlined one of Chile’s successful building systems, called “strong column/weak beam” on Monday. The reinforced concrete in buildings constructed this way is designed to break in certain spots on horizontal beams, which dissipates some of the quake’s energy and saves the vertical columns, keeping the building up. “There is a lot of reinforced concrete in Chile, which is normal in Latin America,” earthquake researcher Andre Filiatrault told The New York Times. “The only issue in this, like any earthquakes, are the older buildings and residential construction that might not have been designed according to these codes.” Cities like Chillan were entirely rebuilt after previous quakes and thanks to new codes, survived this one. 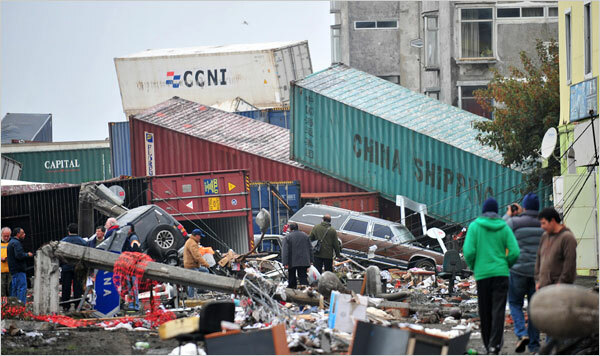 But historic towns like Curico, 180 miles north of Concepción, was almost completely leveled. I am scandalized by the few modern structures that crumbled, those spectacular exceptions you keep seeing on the TV news. The economic bonanza and development frenzy of the last decades have clearly allowed a degree of relaxation of the proud building standards of this country. That’s likely why some new urban highway overpasses, built by private companies with government concessions, are now rubble. 1.5 million Chileans have been displaced, but even those who have homes to return to might not be able to do so yet. Plataforma Arquitectura is organizing a call for volunteer architects to evaluate homes to see if they’re still safe. They are also in touch with Cameron Sinclair’s Architecture for Humanity, which has been leading the rebuilding effort for designers in Haiti. So what about the U.S.? More than 80% of California’s buildings went up before the seismic codes put in place after the San Fernando, Loma Prieta, and Northridge quakes. According to San Francisco engineer Chris Poland, 10 percent of those are bound to fail completely in the next Big One and need to retrofit. It’s a daunting task, but we have to start somewhere.